Stubble cultivation is of major importance within conservation tillage: It incorporates weeds and volunteer cereal seeds into the soil with an intensive mixing and promotes their germination for a more efficient subsequent treatment. The even incorporation of the straw presents a key factor for seed germination. 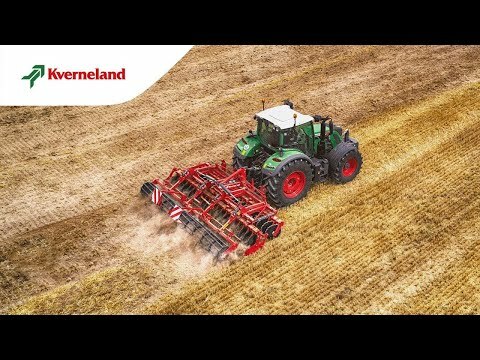 Therefore, Kverneland has designed the Qualidisc Pro to comply with these requirements, but also to offer the farmer a versatile machine which is ready for shallow as well as for deeper cultivation. Extremely sturdy - the Qualidisc is fitted with a frame well-proven with the Kverneland cultivator range. Reinforced headstock and a frame size of 100 x 100 x 8 mm, the Qualidisc can be equipped with the heaviest roller. The brackets of the roller are fixed at the front bar of the frame for a better weight transfer during road transport and also at higher driving speeds. Each angled arm is fitted with a large maintenance-free double ball bearing and 35 mm axle. This high-quality bearing is able to carry heavy radial and axial loads. Special protection on the side of the arm is achieved by a special seal of 5 sealing lips and by the joint protecting the bearing. On the other side the disc is protected against dust by an O-ring. The disc hub is fixed onto the arm by a bolt and special washers that prevent any loosening. The bolt is protected against soil by its position inside the arm. Due to the aggressive discs and the considerable weight (up to 150 kg/disc), the Qualidisc Pro and the Qualidisc Farmer ensure an excellent working quality even under dry conditions. The ground is completely cut, the stubble broken apart and correctly mixed on the surface for a good emergence of weeds and volunteer cereal seeds. Whatever the diameter of the disc, the cutting angle is always constant due to its conical design. Discs of 6mm thickness and Ø600mm for the Qualidisc Pro. Discs of 5mm thickness and Ø520mm for the Qualidisc Farmer. The discs are given a special heat treatment for a long durability and strength. Thus the machine's longevity is increased and the maintenance costs reduced. Kverneland proposes discs with big notches to enhance the rotation in fluffy soil and for a better self-cleaning of the disc with more than 20% of clay. Small notches are kept to maintain the very good cutting quality. According to the soil specifications, the consolidation required, the mixing of the soil and straw, the surface of the soil requested and the lifting capacity available, Kverneland offers a choice of rear rollers. Actiring roller Ø 540mm - 160kg/m: active with the adjustable knives, ensuring a good mixture of soil and straw and consolidation. Actipack roller Ø 560mm - 220 kg/m: heavier, for clod crushing and very firm recompaction of the soil. Adapted also for heavy and sticky soil conditions. Actiflex roller Ø 580mm - 160 kg/m: intensive mixing effect combined with a good recompaction makes this roller the ideal tool for best volunteer's regrowth.